Family Dollar Weekly Ad & Specials. 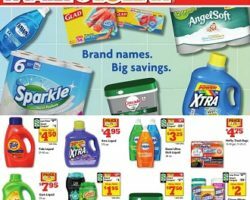 Get this week Family Dollar Ad sale prices, grocery coupons, online circular savings, promotions, and offers. Family Dollar is a retailer in the US that has provided customers good value merchandise for over 50 years. A young entrepreneur by the name of Leon Levine established the Family Dollar business in 1959. Having grown up in his parent’s store, Leon had the essential background that was needed to start the business and made his debut at the age of merely 21 years. His store was sought to cater to families with lower incomes, offering a variety of merchandise at decent pricing. Throughout the years, Family Dollar stores gained in popularity, and the business expanded steadily to now a network of about 9.000 locations operating coast to coast. Social responsibility and sustainability are two core values by which the company abides in today’s ever-changing retailing environment, Family Dollar tending to sustainable business operations. Family Dollar stores have everyday low prices, and in addition, further savings are available through the Family Dollar weekly ad that includes coupon savings and discounts for a range of items.